Are you looking for the best bowfishing bow? Let’s see what bowfishing is first. 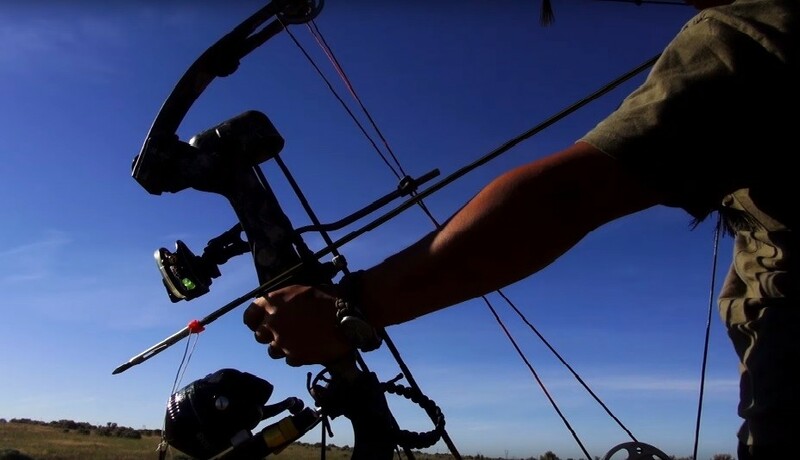 A fishing application utilizing special archery equipment, bow fishing helps bowhunters improve their archery skills while extending the territory of bow hunting. Serving as a means to extend the hunting season, archery fishing or bowfishing requires a perfect combination or archery, fishing and hunting skills in order to capture prey that is by no means easy but is also fun and exciting to hunt for and makes a wonderful trophy for the avid bow angler. The bowfisher will have plenty of freshwater species to angle for and these include the grass carp, common carp, alligator gar, catfish, paddlefish, tilapia, bowfin and bighead carp. For saltwater bowfishing, barracuda, flounder, redfish sharks and rays are common target species. Largely similar to spearfishing, bowfishing employs pointed weapons in place of hooks to bait the fish. Both methods are done while standing on a boat or in shallow water. The difference lies in the actual fishing weapon used, since bowfishing uses a bow to drive the arrow to the target. You can bowfish in the night or during the day. The bowfishing arrow has greater strength and heft compared to a typical or standard archery arrow. Able to travel through the denseness of water and still pierce the target, a bowhunting arrow is made of heavier weight fiberglass, even solid aluminum, fiberglass reinforced with carbon fiber, or pure carbon fiber, so it really won’t travel too far. The fletching or feathers characteristic of archery arrows is noticeably absent, since the bowfishing arrow doesn’t need any element that will only divert its movement in the water, unlike the fletching in archery arrows that propel them to the target. Barbs on the arrowheads are useful for capturing the fish and keeping it stuck to the arrow. The line from the reel is tied to the arrow via a type of slide mechanism that can prevent snapback or bird’s nest. The line used in bowfishing can be made of braided nylon, Spectra or Dacron. Line weight ratings range between 80 to 400 pound test, while 600 pound test line weights are employed for bowhunting alligators. The line can be in different colors, typically neon orange, white or lime green. For bowfishing, one can choose among retriever, spincast and hand wrap reels. The simplest among the three types, a hand-wrap reel comprises a circular spool around which the line is manually wrapped and then secured in a slot that holds the line. A retriever reel holds the line in place via a ‘bottle’. A spincast reel is the perfect choice for bowfishers with advanced skills, since it offers greater speed and higher precision. Optional bowfishing equipment include: polarized sunglasses for easy sighting of the target in water in glaringly bright sunlight; rubber hip waders that keep the angler dry when fishing in shallow water or from the shore; gloves to keep the hands protected; a flat bottomed boat with a quiet motor and rails; good quality light for night fishing. If the bowfisher doesn’t really care about getting soaked, they can wade and shoot instead of fishing from the shore or on a boat. This allows the angler to get as close to the target as possible and utilize good bowfishing skills. Another means to bowfish is by standing on large rocks along shallow sections of a river, which is effective in herding the fish to a second bow angler on standby while wading in the water. Since the fish you see on the surface is just a refracted image of the actual fish in the water, it is best to aim low and then aim even lower. Developed from the ground up with the extremes of bowfishing in mind, the Cajun Bowfishing Sucker Punch has an axle-to-axle length of 32.25 inches with a brace height of 7.25 inches and a peak draw weight of 50 pounds. The unit features two interchangeable draw modules, a draw specific module and a constant draw module with 60 percent let-off, both providing draw length adjustments from 17 to 31 inches. The Sucker Punch is also equipped with deep cam grooves that prevent derailed strings while on the water, and also enable problem-free transport and carrying. Available in a bow only or a ready-to-fish package, this bow is made for the serious bow angler. The ready-to-fish package comes with a Fishing Biscuit Arrow Rest, Cajun Blister Buster Finger Pads, Cajun Hybrid Bowfishing reel, and two white fiberglass arrows with piranha tips to provide the most complete and effective bowfishing kit on the market. This bow allows you to bowfish comfortably without causing finger pinch. Lightweight at only 3.2 pounds, the Sucker Punch is engineered to stick and whip big fish, whether it be carp or alligator gar. This is truly the best bowfishing bow for anglers who want value for money without compromising on reliable performance and consistent power delivery. Shipped to you with two 32-inch long arrows with piranha tips, the PSE Discovery Bowfishing Pkg RH H20 XL transforms the toughest conditions in the water into ultimate trophy-capturing opportunities. Engineered as a rugged package to deal with the most challenging weather, this bow boasts a compact 31.5-inch axle-to-axle length that enables users to work with it effortlessly in cramped boats and tight spaces. Minimal let-off is delivered by the cam. This is in perfect combination with the adjustable constant draw weight of 27 pounds to 40 pounds so the bow angler can always expect to get enough power to propel the arrow through the water and right through tough and stubborn fish scales. Accommodating draw lengths up to 30 inches, the bow has a generous 6.5-inch brace height for effortless bowfishing maneuvers. The bowfishing package comes with the sturdy bow, an AMS bowfishing reel with line, two arrows with a specially designed point and a safety slide and a Snap Shot Rest for real value for money. Consumers can select from right and left hand configurations. This US-made product ensures durability, reliable performance and quality. Lightweight at only 2.7 pounds, the bow comes with a Green Reaper H2O™XL Riser and Green Reaper H2O™XL limbs for the best bowfishing experience. Equipped with one of the most popular bowfishing reels on the market, the RH Advanced Bowfishing Package w/ PSE Kingfisher Recurve Takedown bow features the legendary AMS Retriever #310 that offers the best performance. The reel is geared with reliably strong 130# test line. An extremely well-built bow, this unit is a hard hitter at 50 pounds. To ensure protection for the angler’s fingers, the bow is equipped with finger tabs that prevent blistered fingers so you can fish for extended periods. The roller-style fish arrow bowfishing rest facilitates use. The two included Sure Shot arrows are designed with penetrator fish points that enable piercing through the water and the tough scales of the fish. The AMS Safety Slides on the bow effectively prevent annoying fish arrow snap back to ensure virtually perfect arrow propulsion and flight while ensuring the string is kept forward on the bow, exactly where it has to be. This component fits any standard 5/16-inch fiberglass bowfishing arrow shaft. The bow comes with the needed bushings, shock pad, screw and replacement nock for out-of-the-box functionality. The impressive camo pattern on the riser and limbs deliver that exceptional sense of ruggedness that only the best hunting weapons are engineered to carry. Just the perfect weapon to yield for novice bowfishers, the PSE Kingfisher comes in a kit to let you make the most of your time in the water. Built solidly, this bow is a durable hard shooter that is made pocket friendly yet delivers awesome performance in terms of propelling the arrow fast and true through the water and right on target. Lightweight at just 2.7 pounds, the bow measures 92.7 by 15.9 by 5.7 centimeters for effortless transport and carrying. Featuring an All-Season camo design, this unit offers the capability to face the most challenging bowfishing situations for any serious bow angler. The front-mounting reel simplifies attachment, so you don’t have to stress yourself out putting the bow together after taking it out of the package. The spool has 50 feet of 80-pound test line to accommodate large fish. The 31-inch solid fiberglass arrow has a solid bowfishing point that can penetrate tough fish scales effortlessly. Outfitted with the new Snap Shot arrow rest, this unit is made for both the beginner as well as the veteran shooter. The stainless steel parts of the arrow rest is complemented nicely by the premium-grade aluminum build of the arrow rest itself to ensure resilience against chipping and rust. The draw weight of 45 pounds accommodates most bowfishing needs. The impressive black and dark gray finish offers an exceptional appearance. saltwater fishing. Made in the USA, this product delivers matchless quality and performance backed by Parker’s legendary commitment to excellence. Made compact, perfectly balanced, lightweight and easy to maneuver, this bow makes aiming and shooting in the water effortless. Featuring the brand’s solid limb and synergy cam system, the weapon delivers unparalleled performance. With its adjustable draw weight from 100 to 125 pounds, the Stingray is perfect for targeting medium-sized game all the way up to the monsters. Designed with an easy-draw system, the Stingray can easily be cocked and reloaded for more shooting action. The stock features an elevated column, a contoured pistol grip and a vented forearm for improved feel and control. This weapon features the manufacturer’s proprietary G2 Bull Pup Trigger system. It combines an ambidextrous Auto-Engage safety and anti-dry fire locking mechanism along with a crisp, no-creep trigger pull, simply the smoothest in the industry. The bow comes equipped with: a bowfishing reel; 200 feet of high-visibility dacron braided line; a bowfishing arrow with a quick-release point for precise aiming and shooting. The bow comes with an Open Sight that can be fitted with a low-power illuminated scope for effortless target acquisition at close range. If you are looking for the best bowfishing crossbow your choice is obvious. The bow used in this sport has a simple design, with most models not equipped with sights (useless really for refraction and depth) since aiming is purely done through line-of-sight snap decision down the arrow. Two types of rests can be selected from namely, roller and hook rests. Bowfishing bows also feature little to zero let-off and low draw weight. Those elements are determined primarily by preference or what the weapon itself is engineered with. Bow anglers can select from traditional bows, which come in either recurve or longbow configuration. Compound bows are a modern weapon that employ a system of pulleys to make shooting more effortless for the archer. These types of bows come with as high as 120 pounds or 50 kgs draw weight. Like compound bows, recurve bows are small yet offer a remarkable amount of force to drive an arrow while taking up little space in your fishing boat. Bowfishing has long been used as a means of gathering food for generations, and the fact that it has become a method of recreational fishing only drives the fascination notch higher for this kind of activity. Targeting ‘rough’ or bottom-feeding fish, bowfishing may not exactly be what purists who prefer the standard rod-and-reel configuration find worthy of spending time on. This is despite the fact that bowfishers regularly take home plenty of rough fish after just a short time in the water. Bowfishing regulates the ecology of any given area, a means of controlling the invasive or alien fish species that tend to compete with the space and resources used by the more desired or prized fish populations, thus bringing balance to the ecosystem. Becoming increasingly popular among fishermen and hunters alike, bowfishing is definitely here to stay. Get yourself the best bowfishing bow you can afford and meet me at the lake!